A traveller’s spirit is engrained in the Peter Pilotto aesthetic now. As many before me have astutely noted, print used to be the defining feature of their collections—now it’s travel. The shift towards this began in Spring 2016 where they referenced Greece; the following season it was the enchanting Aurora Borealis. The duo are fervent voyagers, sponging world culture with every excursion. For Fall 2017 they began to look at their heritage—Pilotto is Austrian-Italian, de Vos is Belgian-Peruvian. Austria and Peru were the two destinations in mind. The references to Austria encompassed the season at hand—in all, there was evidence of a trans-seasonal approach. There were decadent furs and decorative knits. Jay Wright’s beige sweater featured both illustrative totemic badges and furry patches that haphazardly snaked the garment. The anoraks that opened the show were woven tweeds with collars lined in fur. If this collection was about home, the homeliness was felt in the warmth of the clothing—texturally and stylistically. The South American flair that pervaded their last outing—where they were inspired by the work of architect Luis Barragán—was once again palpable. The collection was awash with warm tone and bright, punchy hues. The introduction of drapery imbued the effortless nonchalance of a Peruvian summer. That isn’t to mention the supposed Incan symbology that acts as surface decoration on many of the pieces. I used the words “richness” and “exuberance” when discussing the arts in South America in my review last season. 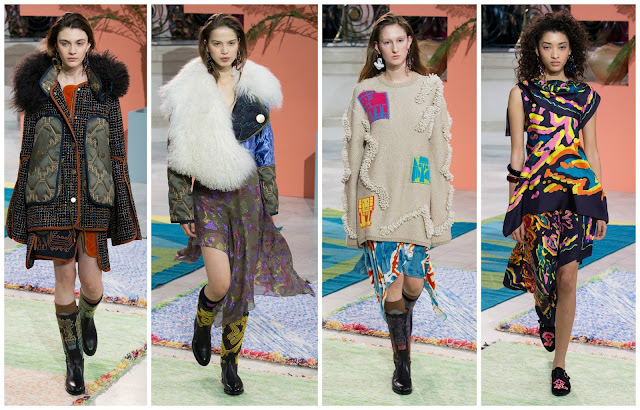 Pilotto and de Vos once again wove this into the show: there were the aforementioned badges found on sweaters, swirling embroideries. One imagined the designers intended to dilute, soften the eclectic colouration of Barragán in this show. They mentioned “allusions to Highland exploration.” It explained the sturdy boots that were styled with many looks. It also signified the clarity of expression one was struck with in this collection. The traverse between South America and Europe was a smooth one—there wasn’t a sense of incongruity or meaninglessness in combining two disparate cultures; it was a dense, rich observation on how women want to dress today while also referencing the world at large. It works in a similar way to Michele’s Gucci: travelling the world, collecting trinkets, building something new from old.